Bombay in 1946 was an epicentre for the cry for freedom from the British Raj. Lots of now famous and some infamous things happened during this time. 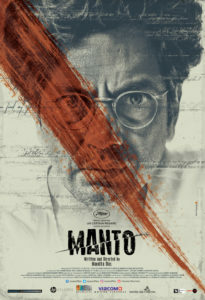 One of these is the story of the biopic of the Urdu Bollywood scriptwriter Saadat Hasan Manto, played by Nawazuddin Siddiqui. Manto, written,directed and produced by Nandita Das, tells his story through the eyes of those around him. This film has already been acclaimed at Cannes and was recently released to Indian audiences on the 21st of September. The music direction of the movie has been given to Sneha Khanwalkar. Already well known for the Gangs of Wasseypur franchise and Detective Bymokesh Bakshy! amongst others, her gritty and real-life music is often perfect for the period, without needing to take the audience back to it. In this film its important to realise that the music is pre-Lata Mangeshkar when the giants were Shamshad Begum and Noor Jehan, where Mohammad Rafi was but a young upstart taking over from the recently retired KL Sehgal. So, it should be no surprise that the songs sound a bit off-tone sounding but also that they are nasally voiced. Rekha Bharadwaj is a perfect opening example in the first song, Ban Titli (Gratis). Nothing more than harmonium and tabla to back her lightly nasal voice, the song seems to be set for a courtesan environment. In films of those days these songs could go on for nearly 10 mins depending on the importance of the moment. To keep it modern Sneha has created a short song: as much as to keep the story flowing, as to hide the lack of lyrics. Nevertheless, this could be straight out of 50s or 60s Bollywood starring Dilip Kumar watching on while a ‘kaneez’ falls for him. Following on in the same sound but for a completely different feeling is Ab Kya Bataun. Starting out like a qawwali, Shubha Joshi’s nasal tones are backed by harmonium and tabla singing “Ab kya bataun, ki tere milne se kya mila”. Slowly the song seems to break out into a jazz club vibe with added synth sounds to modernise the sound even further. High hat and bass drum combine with strings give a slow big band feel. Shubha Joshi becomes very light in voice until a muted trumpet overrides her towards the end and becomes a bridge. Once again this seems to cover the lack of many lyrics but the sublime feeling of this song covers over it well. For those who have been exposed to songs of this period, SD Burman is the music director whose name most easily pops up. His legacy is so tied to this period, that some of the most famous ones are ones he sang himself. In Nagri Nagri, technology is used to take the audience back there, and listeners will get to hear that voice once more! On first and even second listen its hard to tell that the voice is Shankar Mahadevan for the first 90 seconds. Backed up by mridangam and finger clicking sounds, this sounds like the actor is listening to the song on a gramophone or radio. A strange echo effect is added after 2 mins as Shankar Mahadevan steps up to the fast-paced lyrics like in his composition Breathless, except this time arabic drums came up in the background for support. Finally, comes a proper azadi song in Bol Ke Lab Azaad Hain. Once again technology plays a part with screeching violins to drag in the audience’s attention. Vidya Shah is made to sound like Shamshad Begum and Ustad Rashid Khan brings his classical tones in this driving, patriotic song. The violins seem to be controlling beat and rhythm, a harmonium comes in half way to provide a bridge and a clarinet similar in style to Shankar Tucker is added to bring an odd but interesting sound. Before concluding, a bonus track must be noted. This is not part of the album per se, however its definitely a very interesting take on this film and its music. Mantoiyat by Raftaar with dialogues interspersed by Nawazuddin Siddiqui is a hard rap song unlike any other rap songs used in films this year. This is definitely on the 18+ list with some heavy swearing throughout the lyrics and Raftaar not only giving an angry rhyme but a very angry song. A light angelic chorus is always hiding in the background sometimes under, sometimes over the hard beats. There is no holding back here at all, its very frank and to the point. This album certainly feels like its for the period around independence even though there are some interesting instrumentation choices. There is also a lot of reliance on the singers to perform what they are best known for, which can sometimes cause more problems as singers try for something a little different while sticking to the required mood or style. Yet, these things come together well to find a happy medium between old and new; allowing for those who want to listen to the songs as reminders of those days and for those who need to listen to something a bit different from the normal renditions of bhangra or hip-hop. The fact that Raftaar has also got involved can only mean it must get a very high rating. 15 queries in 0.340 seconds.